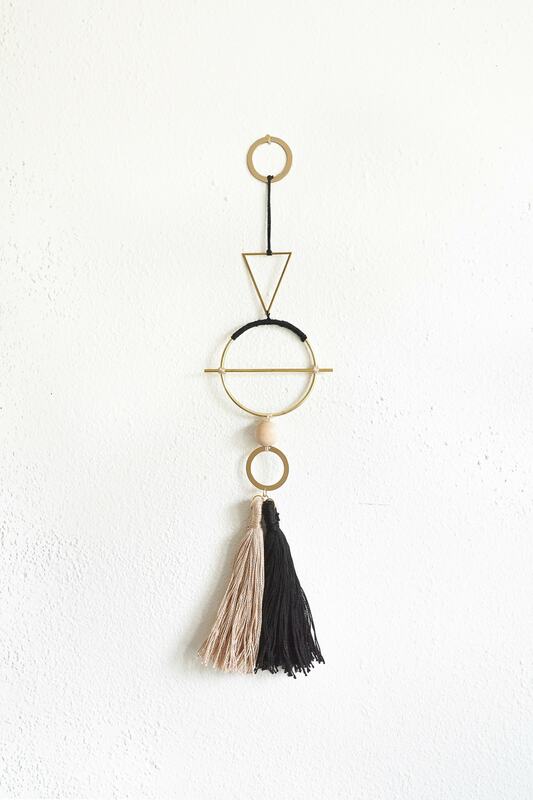 The geometric wall hang trend is all the rage at the moment! 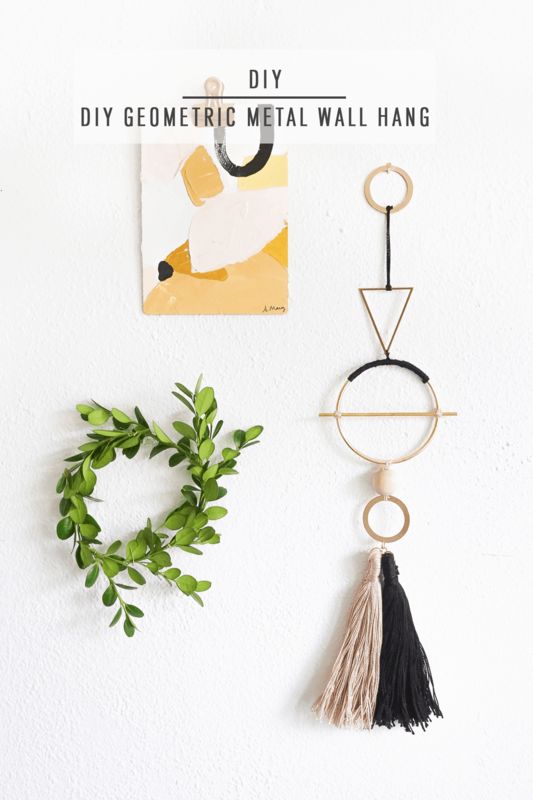 From weavings to macramé, I’m constantly seeing lots of free-form ways to add interest to the wall. 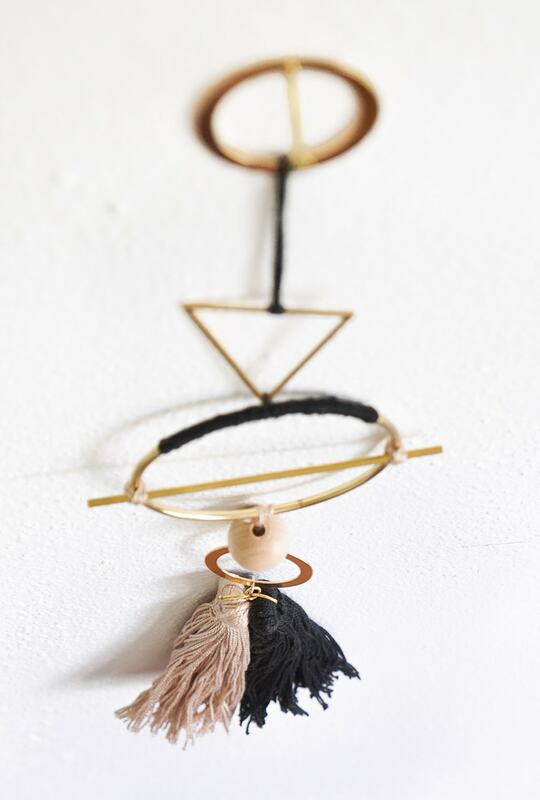 I, Erin, love wall hangs that mix & match all sorts of materials like brass, textiles, fibers, and even wood. 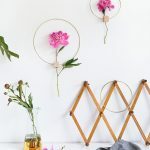 This DIY Geometric Metal Wall Hang is as easy as stringing together different shapes and acts as a bit of jewelry for the room. 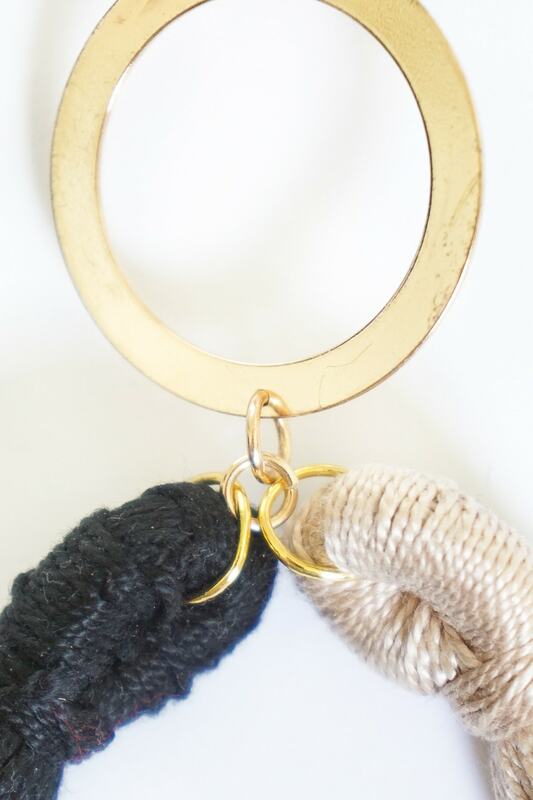 Begin by wrapping a portion of the 3” gold hoop with cotton flossing. 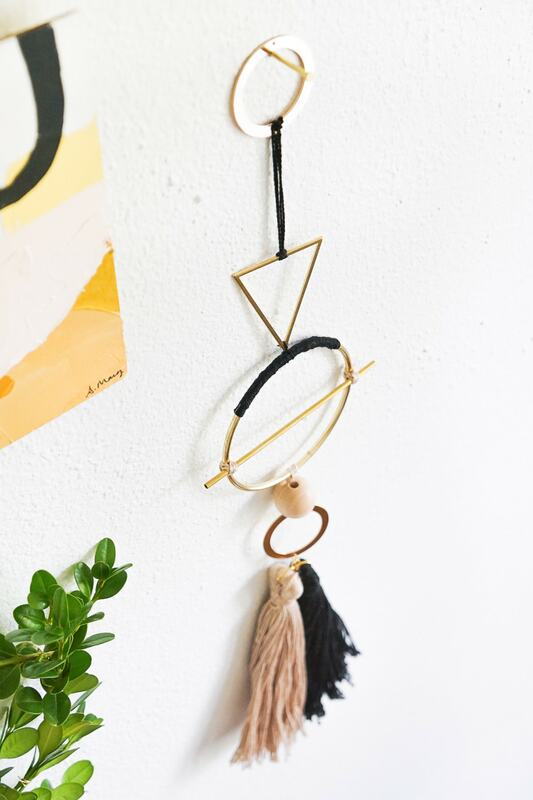 Leave a 5” tail of flossing and tie a knot onto the hoop. Continue wrapping the flossing around both the hoop and the tail until you’ve completed a 3” run of wrap. Finish off the wrap by double knotting the loose end to the tail and trimming off the excess. 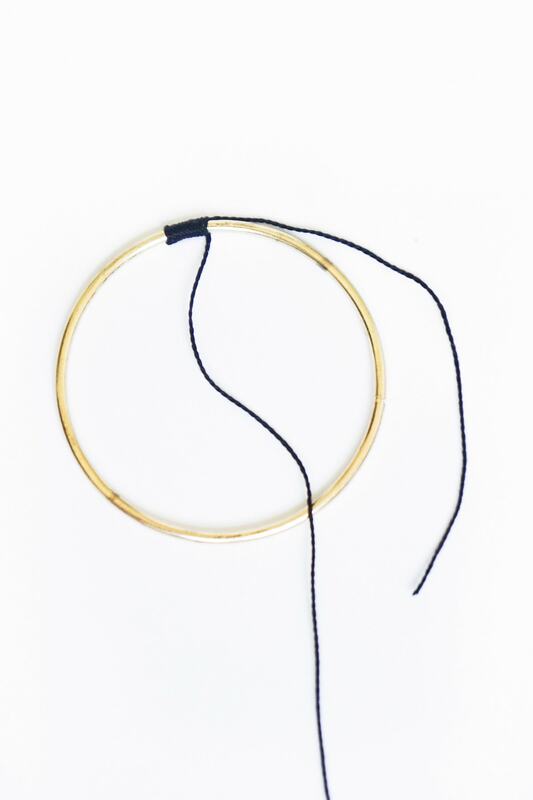 Lay the gold bar across the diameter of the hoop and attach with flossing. Begin with a knot around both the hoop and the bar at one end. Leave a tail as you did with the wrap in the previous step. Then continue wrapping in an X pattern around both sides of the bar. Tie off the flossing with a double knot and repeat with the other end of the bar. Set the hoop aside. Now that the hoop details are done, begin assembling the wall hanging beginning at the bottom. 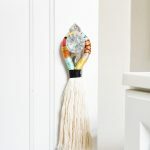 Use pliers to attach a jump ring to each of the tassels and join them together with a third jump ring. 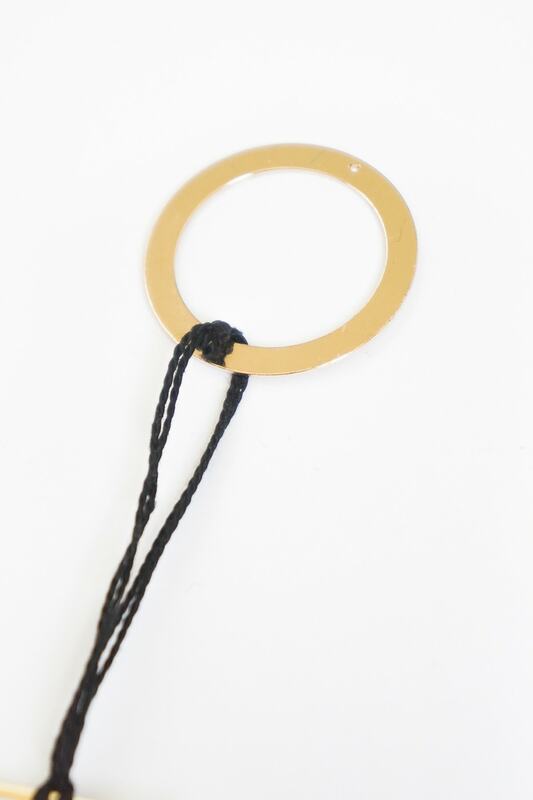 Attach to a fourth jump ring and attach onto one 1-3/8” circle. Cut a 6” long piece of flossing, fold it in half, wrap it around the top of the 1-3/8” circle, pull the ends through the loop and pull tight. 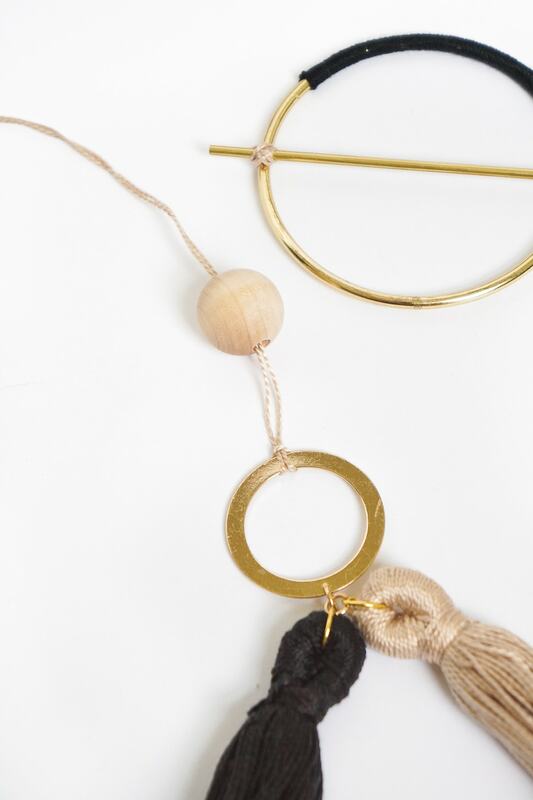 Thread the flossing through the wood bead and double knot it to the bottom of the prepared 3” circle. Trim excess flossing. 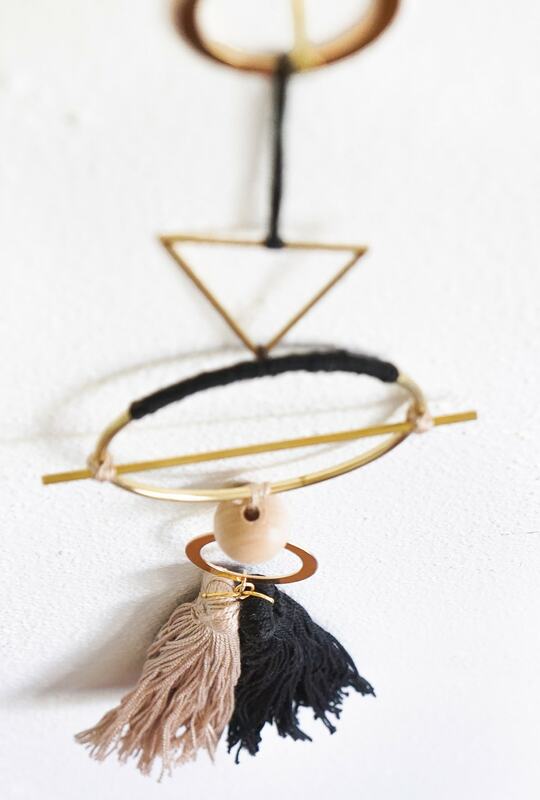 Next attach the inverted triangle to the top of the 3” circle in the sample loop tie as in the previous step. (Fold a piece of flossing in half. 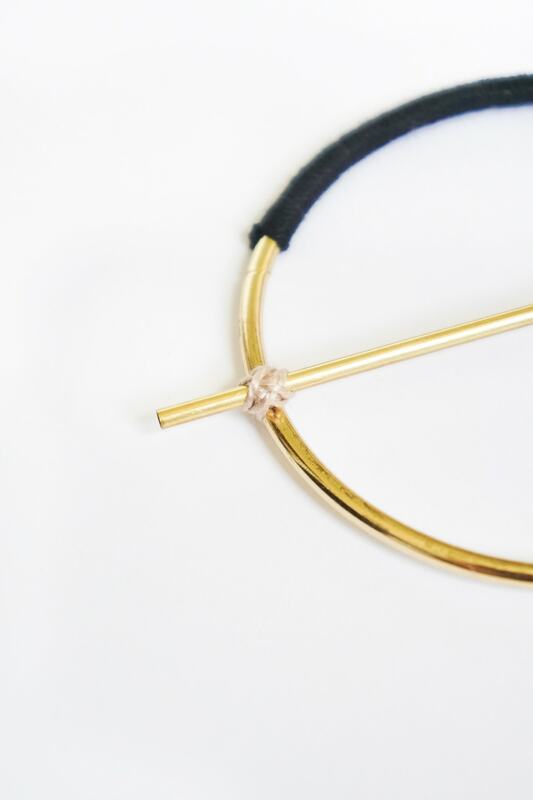 Wrap it around the top of the 3” circle and pull the ends through the loop and pull tight.) Double knot the ends around the triangle point, and trim the excess tails. Lastly, cut another piece of flossing roughly 10” long. 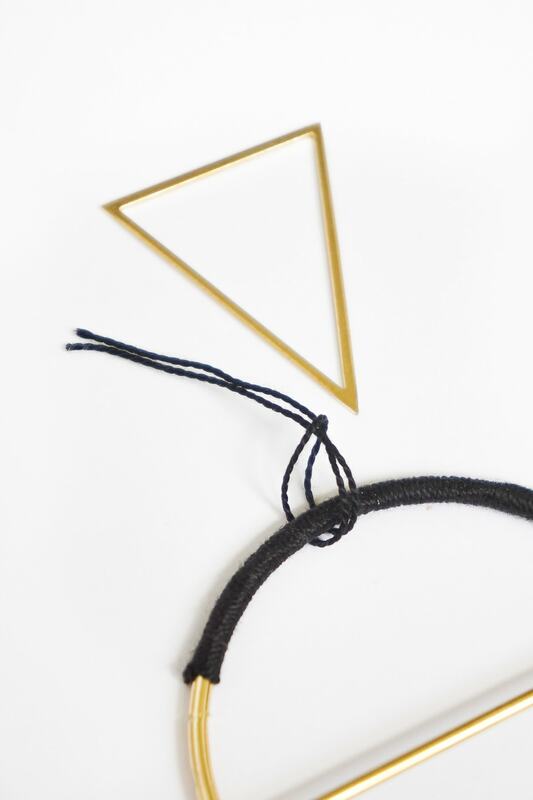 Fold the flossing in half and wrap it around the middle of the horizontal triangle edge. Pull the ends through the loop and pull tight. Leave about 3” of flossing before double knotting it onto the 2nd 1-3/8” circle. Once that is complete, then trim the flossing tails. 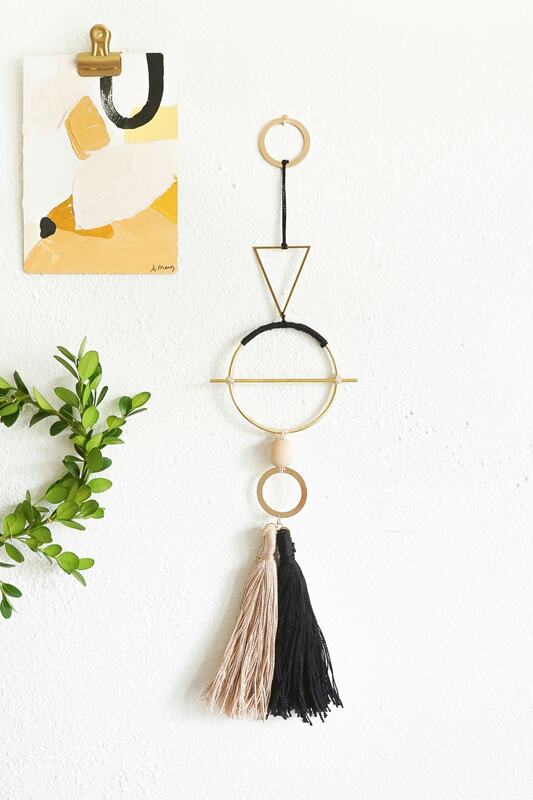 Now you are ready to display your wall hang and show off your favorite metals & textiles! 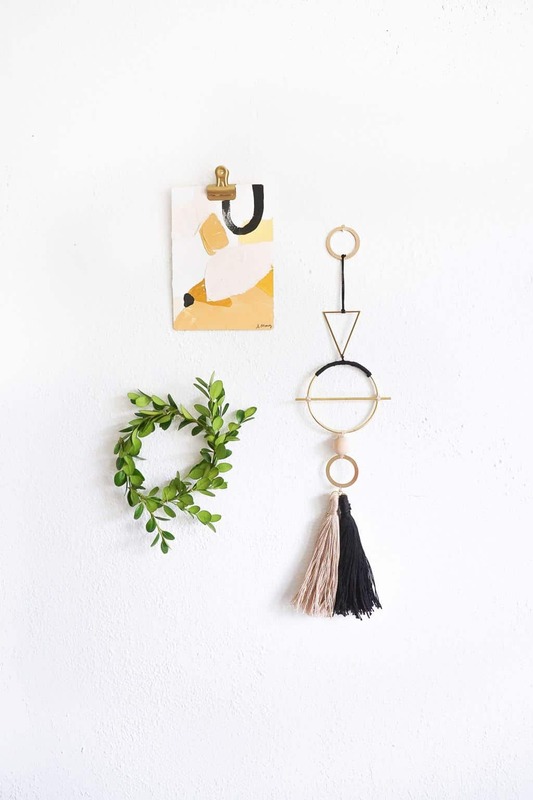 I love the instant modern aesthetic this wall hang brings to the room, and I especially love how easy it is to achieve it. 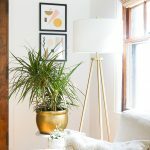 This is definitely a home decor trend that I can get behind! Looking so nice! 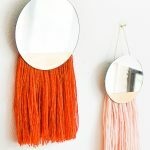 I am so inspired by this DIY. Looking for several pieces to build a personalized one. So happy you like it, Mike! It’s always so much fun to get to personalize home decor. Hope you love it as much as we do! Love this! The link to Jo Ann’s is not valid, can you fix it? Thanks Eli! Erin did such an amazing job! Unfortunately it looks like Jo Ann’s only carries this item in-stores. Here is one online that is similar! That is really interesting, You are an excessxively skilled blogger. anything like this before. 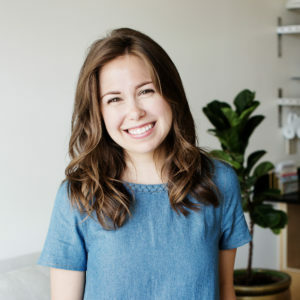 So wonderful to find another person with unnique thoughts on this topic. that is rrequired on the web, someone with some originality!